This is such a great recipe as it can be done in one food processor or blender and it really simple and quick. They also store well in the fridge or freezer (can last the week in the fridge). I made a huge batch last week and have been having one a day in the morning or afternoon as a snack. The ingredients that are chosen have a great healthy fat profile to keep you full during the day. 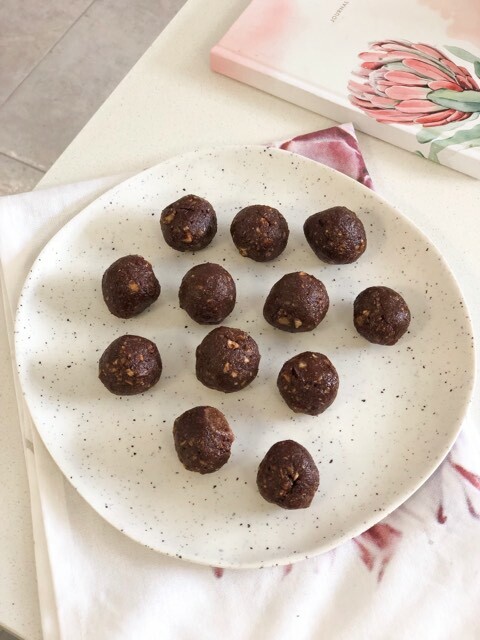 The addition of dates, raw cacao and honey are all perfect ways to get over that mid-afternoon slump with more natural sweeteners rather than other more processed snacks that you can get from the store. The recipe is gluten free, dairy-free and can be made vegan (by substituting the honey for maple syrup). Definitely on of those recipes which you can whip up between other meal prep on the weekend and can have on hand for the week when you feel like something sweetener but without the added preservatives or added sugars that can be found in some other snacks. Add all ingredients into a blender or food processer and blend until smooth. If mixture is too dry, add some water. Roll into ~11 balls. Option to roll in shredded coconut before putting in the fridge.